Card Philippe Barbarin brought the pontiff's video message. In Turkey, the pope called for greater collaboration with the international community to resolve conflicts in Iraq. He thanks refugees for their witness of faith. On 8 December, he will call for a special prayer by the whole Church for Iraqi Christian refugees in Erbil. Erbil (AsiaNews) - Pope Francis sent a video message to Christian refugees from Mosul, currently living in Erbil, Kurdistan. The occasion was the visit by Card Philippe Barbarin who, with a hundred faithful from his diocese of Lyon, is visiting today with the faithful from Mosul diocese. The two dioceses are twinned. In the message, the pope expresses his regrets for not being able to be physically with them, consoles them for their suffering, and thanks them for their resistance and witness of the faith. Inspired by an image of Saint Therese of the Baby Jesus, Francis tells persecuted Christians that they are like a "reed" that "painfully" bends. However, "you have the strength to carry forth your faith, which is a testimony to us. You are God's reed today! The reeds that bend under this ferocious wind, but then rise up again. The pope lists all the actions and appeals he launched in Turkey in favour of Christians, Yazidis and other persecuted people and stresses his call for "greater international cooperation" to resolve conflicts in Iraq. Francis also said that he would ask for a special prayer for Iraqi Christians on 8 December, the feast day of the Immaculate Conception. "I would like to greet each and every one of you, along with Cardinal Philippe Barbarin, who once again brings you the concern and the love of the entire Church. I too would like to be there with you, but since I am unable to travel, I will do this instead . . . but I am very close to you in these difficult moments. 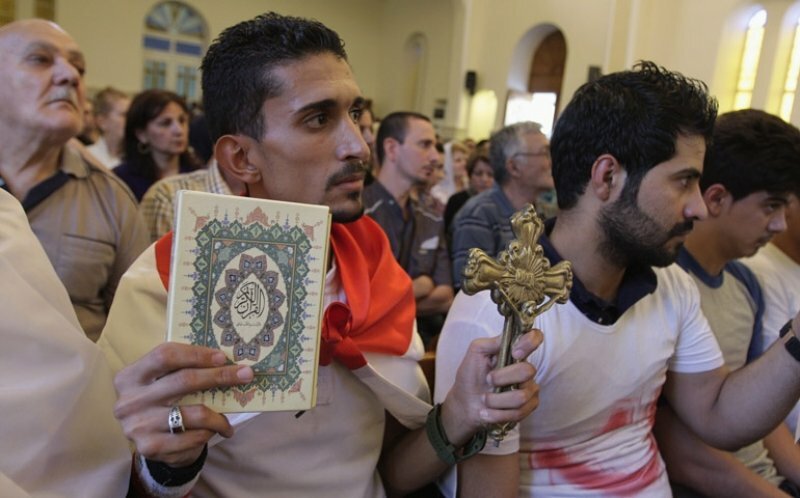 I said, during my return journey from Turkey: Christians are being driven out of the Middle East, with suffering. I thank you for the witness you give; and there is a great deal of suffering in your witness. Thank you! Many thanks. "It would seem that there they do not want there to be any Christians, but you bear witness to Christ. I think of the wounds, of the pain of women with their children, the elderly and the displaced, the wounds of those who are victims of every type of violence. "As I mentioned in Ankara, particular concern is caused by the fact that above all, due to an extremist and fundamentalist group, entire communities, especially - but not only - Christians and Yazidi, have suffered and continue to suffer inhuman violence because of their religious and ethnic identity. Christians and Yazidis have been forced out of their homes, they have had to abandon everything to save their lives, but they have not denied their faith. Even holy buildings, monuments, religious symbols and cultural heritage have been affected by the violence, almost as if to cancel every trace, every memory of the other. "As religious leaders, we are obliged to denounce all violations of the dignity and rights of humanity. "Today I wish to draw closer those of you who tolerate this suffering, and to be close to you . . . And I think of St. Therese of the Baby Jesus, who said that she and the Church were like a reed: when the wind rises and the storm comes, the reed bends but it does not break. At the moment, you are like this reed: you bend painfully, but you have the strength to carry forth your faith, which is a testimony to us. You are God's reed today! The reeds that bend under this ferocious wind, but then rise up again. "I wish to thank you again. I pray that the Spirit, Who makes all things new, will give each of you strength and resistance. It is a gift of the Holy Spirit. And I strongly urge, as I did in Turkey, greater international collaboration to resolve the conflicts that cause blood to be shed in your lands of origin, to combat the other causes that lead people to leave their homelands and to promote suitable conditions for them to remain or return. I hope that you will return, that you will be able to return. "Dear brothers and sisters, you are in my heart and my prayers, and in the hearts and prayers of all Christian communities, whom I will ask to pray in a special way for you on 8 December, to pray to Our Lady to protect you: she is our mother and will protect you. "Brothers and sisters, your resistance is martyrdom, it is dew that brings fruitfulness. Please, I ask you to pray for me. May the Lord bless you and Our Lady protect you. "May God almighty, the Father, the Son and the Holy Spirit, bless you." Saddened by "the timidity of the civilised world," Baghdad patriarch's heart bleeding "for the innocent in Iraq, Syria and Gaza"